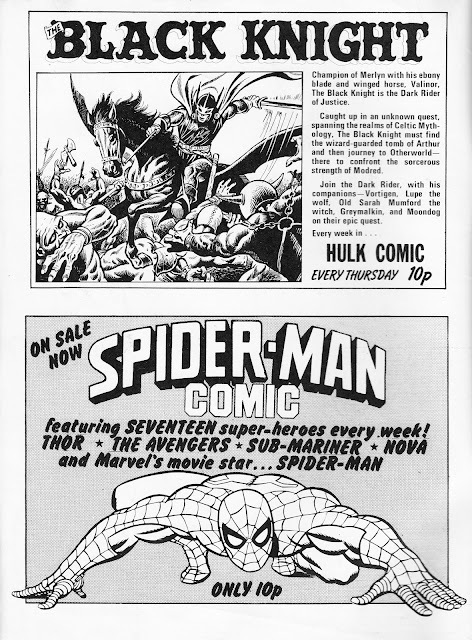 This is a MARVEL UK HOUSE AD from 1979 plugging two of the weeklies from the Skinn era: HULK COMIC and SPIDER-MAN COMIC. The "movie star" reference refers - of course - to the faux feature films derived from the short-lived live-action TV show. SR, did you say "faux feature films", plural? I remember only one Spidey "movie" but it was a long time ago ! There were actually THREE Spidey flicks in the late seventies. SPIDER-MAN was the feature-length CBS pilot, SPIDER-MAN STRIKES BACK was the two-part TV story The Deadly Dust and THE DRAGON'S CHALLENGE was the Hong Kong-lensed The Chinese Connection. Marvel have done a good job keeping both the films and TV show buried in the era of the big-budget theatrical series but all three of the faux features were mainstays of the British VHS era and seemed to be repackaged and re-released every few years. They could normally be found in the kids section of Woolworths (R.I.P). I have - occasionally - spotted them in charity shops but as VHS tapes vanish altogether, they're becoming pretty hard to find. Ironically, Marvel have hidden them from sight in the last decade-or-so but clips did appear in the Channel Five documentary THE SPIDER-MAN STORY which had the whiff of being at least semi-approved by Marvel (lots of lovely licensed clips from most of Spidey's screen adaptations) and first aired to promote the first feature film (and was repeated - as a revised edit - for the second film).